Chang Ho Lim started playing the violin at age of 8, and made his debut concert with the Seoul National Symphony Orchestra through the Kumho Prodigy Concert series. Since then, he has appeared as a soloist and a chamber musician in Weill Recital Hall at Carnegie, Alice Tully Hall, Paul and Morse Halls at Lincoln Center, Kumho Prodigy Concert series, KBS Hall, Sejong Arts Center in Korea, and the Seoul Arts Center’s Christmas Concert which was broadcasted nationally. He attended the Aspen Music Festival as a fellowship recipient 2004-2006. He participated in masterclasses by Cho-Liang Lin, Dong-Suk Kang, Joseph Silverstein, Rodney Friends, Pamela Frank and Igor Ozim. 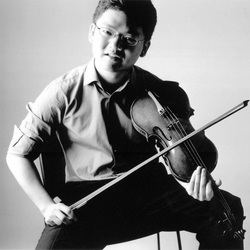 Chang Ho Lim won second prize Corpus Christi International Competition in 2003, first place New York Music Competition and seven national competition prizes in Korea including Joongang and Ewha KyungHyang. After he entered the Seoul Arts high school with the highest honors, he moved to New York to attend the Juilliard School. He is currently studying with Donald Weilerstein and Naoko Tanaka at Juilliard where he recently received the Bachelor of Music degree in May. He will start his graduate studies in September at Juilliard.